This set will leave you with luxurious, healthy -looking, soft, hydrated hair. This holiday exclusive makes the purr-fect holiday gift. A unique, modern-textured gel-cream hair masque that deep cleans, gently conditions, and features an activated charcoal blend that purifies and helps balance the scalp for optimal scalp health and hair beauty. heavenly hydrating cloud for improved vibrancy, shine and manageability. A rich hair masque that provides nourishing moisture replenishment to restore dry, dull, brittle hair to its soft, silky condition. KEY INGREDIENTS: COCONUT OIL, A blend of two activated charcoals derived from BAMBOO and NORTH AMERICAN HARD WOOD. INGREDIENTS: Water (Aqua), Limnanthes Alba (Meadowfoam) Seed Oil, Crambe Abyssinica (Abyssinian) Seed Oil, Stearamidopropyl PG-Dimonium Chloride Phosphate, Cetyl Alcohol, Coco-Caprylate, Cocos Nucifera (Coconut) Oil, Hydroxypropyl Bis-Hydroxyethyldimonium Chloride, Cetyl Phosphate, Charcoal Powder, Bambusa Vulgaris (Bamboo) Charcoal Powder, Tocopherol, Cetyl Hydroxyethylcellulose, Fragrance (Parfum), Glycerin, Limonene, Potassium Hydroxide, Ethylhexylglycerin, Benzyl Benzoate, Benzyl Alcohol. KEY INGREDIENTS: REJUVENIQE S™, PatcH20™, Ceramide Complex, Fision Kera Veg18, Mururmuru Seed Butter, Babassu Kernel Oil. INGREDIENTS: Aqua/Water/Eau, Glycerin, Cetearyl Alcohol, Orbignya Speciosa Kernel Oil, Ethyl Macadamiate, Betaine, Propanediol, Hydroxyethyl Acrylate/Sodium Acryloyldimethyl Taurate Copolymer, Ceramide NP, Ceramide AP, Ceramide EOP, Hydrolyzed Jojoba Esters, Jojoba Esters, Astrocaryum Murumuru Seed Butter, Limnanthes Alba (Meadowfoam) Seed Oil, Crambe Abyssinica Seed Oil, Camellia Oleifera Seed Oil, Solanum Lycopersicum (Tomato) Seed Oil, Daucus Carota Sativa (Carrot) Seed Oil, Citrus Limon (Lemon) Peel Oil, Citrus Aurantifolia (Lime) Oil, Citrus Aurantium Bergamia (Bergamot) Fruit Oil, Adansonia Digitata Oil, Mauritia Flexuosa Fruit Oil, Cocos Nucifera (Coconut) Oil, Gardenia Taitensis Flower Extract, Moringa Oleifera Seed Oil, Caryocar Brasiliense Fruit Oil, Helianthus Annuus (Sunflower) Seed Oil, Olea Europaea (Olive) Fruit Oil, Simmondsia Chinensis (Jojoba) Seed Extract, Sodium Hyaluronate, Wheat Amino Acids, Soy Amino Acids, Arginine HCl, Serine, Threonine, Tocopherol, Carrageenan, Trehalose, Urea, Pentylene Glycol, Glyceryl Polyacrylate, Algin, Caprylyl Glycol, Cetearyl Glucoside, Pullulan, Disodium Phosphate, Potassium Phosphate, Phytosphingosine, Cholesterol, Sodium Lauroyl Lactylate, Glucose, Carbomer, Xanthan Gum, Disodium EDTA-Copper, Fragrance/Parfum, Citric Acid, Benzyl Alcohol, Ethylhexylglycerin, Limonene, Linalool, Hydroxycitronellal, Geraniol, Coumarin, Alpha-Isomethyl Ionone, Citronellol. KEY INGREDIENTS: REJUVENIQE™, PROCATALINE™, Amino Acid Complex, Sweet Almond Oil, Macadamia Oil, SENSOVEIL SIL™. INGREDIENTS: Aqua/Water/Eau, Cetearyl Alcohol, Brassicamidopropyl Dimethylamine, Behentrimonium Chloride, Orbignya Speciosa Kernel Oil, Fragrance (Parfum), Pisum Sativum (Pea) Extract, Prunus Amygdalus Dulcis (Sweet Almond) Oil, Macadamia Integrifolia Seed Oil, Linum Usitatissimum (Linseed) Seed Oil, Hydrogenated Soybean Oil, Limnanthes Alba (Meadowfoam) Seed Oil, Crambe Abyssinica Seed Oil, Camellia Oleifera Seed Oil, Solanum Lycopersicum (Tomato) Seed Oil, Daucus Carota Sativa (Carrot) Seed Oil, Citrus Limon (Lemon) Peel Oil, Citrus Aurantifolia (Lime) Oil, Citrus Aurantium Bergamia (Bergamot) Fruit Oil, Adansonia Digitata Oil, Mauritia Flexuosa Fruit Oil, Cocos Nucifera (Coconut) Oil, Gardenia Taitensis Flower Extract, Moringa Oleifera Seed Oil, Caryocar Brasiliense Fruit Oil, Helianthus Annuus (Sunflower) Seed Oil, Glycerin, Wheat Amino Acids, Soy Amino Acids, Arginine HCl, Serine, Threonine, Disodium EDTA, Limonene, Citric Acid, Benzyl Alcohol, Dehydroacetic Acid. 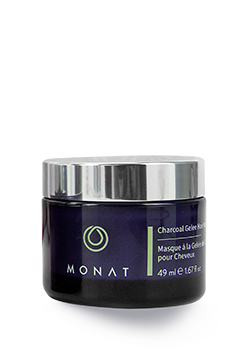 Charcoal Gelée Masque- Apply to clean, towel-dried hair, focusing on the scalp. Massage the masque in circular motions and work through the hair from scalp to ends. Leave on 5 minutes. Rinse well. Condition with your favorite MONAT Conditioner. Can be used 1-2x a week. 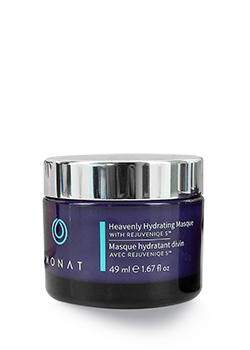 Heavenly Hydrating Masque- Shampoo and towel-dry hair. Apply the Masque to hair. Massage into the hair, ensuring an even application. Leave on for 5 to 10 minutes, then rinse out thoroughly. For best results, use 1-2x per week. Super Moisture Masque- Apply evenly to clean, damp or towel-dried hair. Leave on for 5-10 minutes, then rinse. Can be used 1-2x a week.